Finally! A weekend day where it isn’t raining, snowing, or icy cold with the remnants of freezing temperatures and winds that chill you to the bone. I was very pleased to be up and outside in the garden with RubyCat by 9am AND without a coat. I had loads of jobs to get done. I was pleased to finally find a Daffodil that hadn’t been flattened by wind, rain, or snow. A cheery lone fanfare of Spring’s arrival. 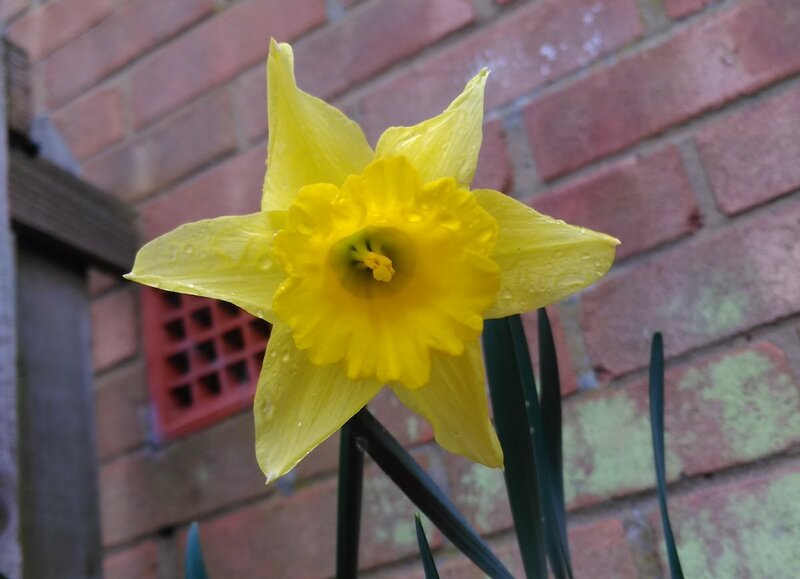 A container-grown yellow Daffodil celebrates a lack of snow. First up, was to finish putting up some more shelves in my shed. When i moved in, this shed was shelf-free, and I brought some cheap pine shelving with me, but with the demolition of the rickety old shed, this has given me enough planks to turn into shelving. The most significant shelf being the full length one that runs under the shed window. To make this, I bought some inexpensive brackets from my local DIY store, and then took the old shed door and cut it down the length – thankfully it was 6 planks wide – so it made the perfect 3 plank wide shelves. I put those up with my new drill/screwdriver, and was then able to start pricking out some seedlings. 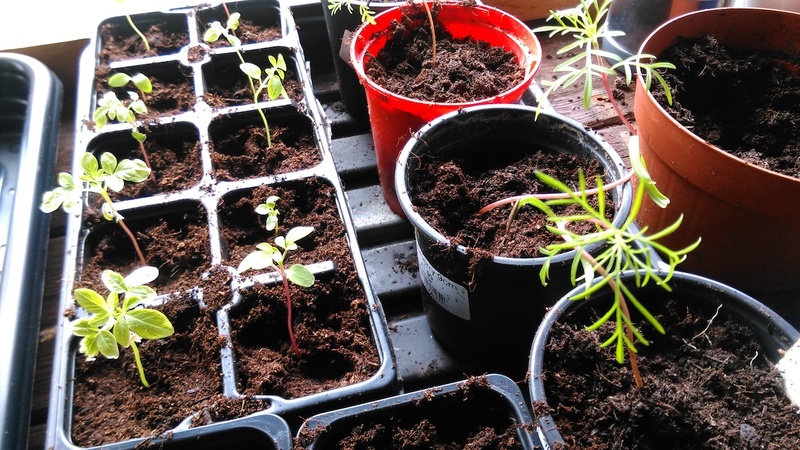 I planted some Cleome ‘Colour Fountain’ seeds a few days ago, and they have shot up, so I took the opportunity to use this new-found workspace to start potting them into individual plugs. Cleome ‘Colour Fountain’ seedlings (left) with Cosmos ‘Seashells Mixed’ (right) have been pricked out. 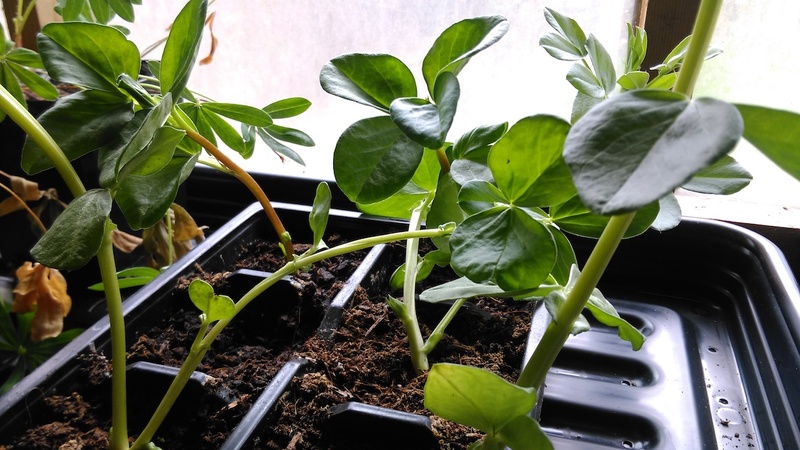 I also took the four surviving Cosmos ‘Seashells Mixed’ seedlings (RubyCat had been pulling them out of the pot and spitting them on the carpet until I moved them out of reach!!). I potted these on, and sowed some more as they were so pretty last summer. 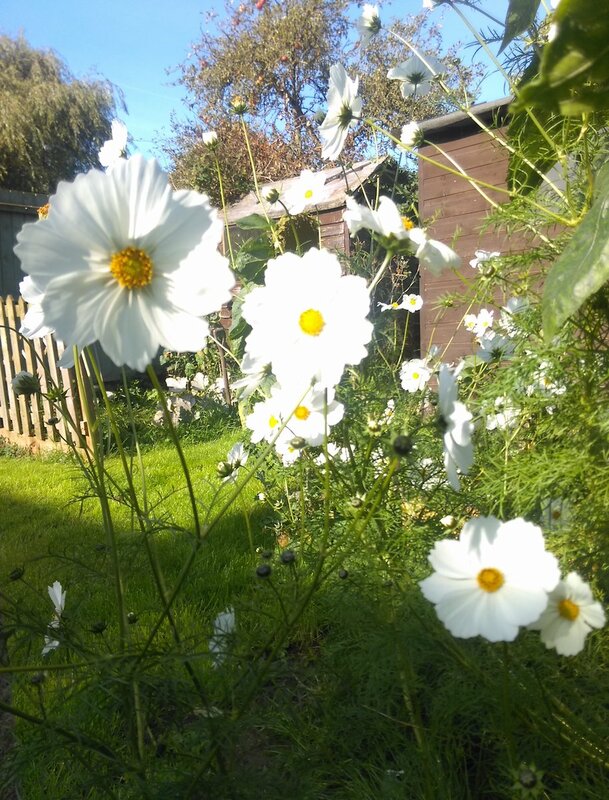 Some of the Cosmos ‘Seashells Mixed’ reached about 4 feet tall. I found a little pot of Honesty seeds that I must have collected from my parents garden a few years back. I added these to a pot of compost – not expecting much – but they had been stored carefully in a sealed container. You never know! Once you’ve got Honesty, you tend to have it forever seeding itself all over the place. I also sowed some Lettuce ‘Red Salad Bowl’ seeds. I think that these were the variety that grew from that old out-of-date Erin seed kit. I’m growing these again because the slugs and snails did not touch them. 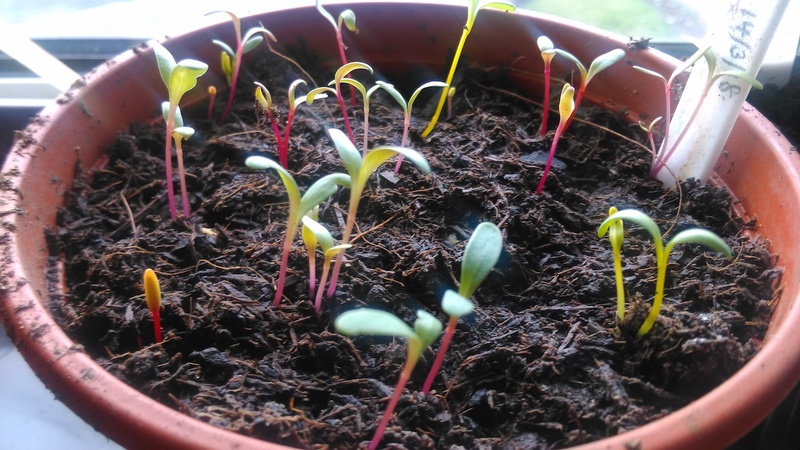 Ten days ago I also sowed some Swiss Chard ‘Bright Lights’ – my first ever time growing these – having been completely inspired to by the blog and videos by Katie at Lavender & Leeks (thanks, Katie!) and it turns out they’re packed with nutrients. Swiss Chard ‘Bright Lights’ seedlings showing their coloured stems. In addition to my first-time Chard, my first-time Broad Bean ‘Crimson Flowered’ seeds have been growing on a cool windowsill in my spare room. Whilst I’m only growing half a dozen, I’ve done two sowings and gotten 5 plants! The first 3 plants shot up, and the next 2 did too. Are Broad Beans usually temperamental? The plants are now in the shed to begin a hardening-off process, and they joined the Lupin ‘Band Of Nobles Mixed’ (remember them?) which I sowed a year ago in 2017. These plants take a while to mature, and somehow they’ve survived a year on windowsills, despite the recurring threats of central heating. Hopefully the slugs and snails won’t eat them in the first evening. My windowsills are now covered in trays, propagators, and seedlings. It finally feels like spring has arrived and the garden of 2018 is coming. What jobs did you get done in the garden this weekend? As ever, thank you for reading. Go-on, share this blog post somewhere, and have a happy gardening weekend!